Standing in a Spanish Doorway: Has a "European Spring" started? Has a "European Spring" started? Press conference in front of the office of the EU in Madrid. Photo from Desmontando Mentiras. 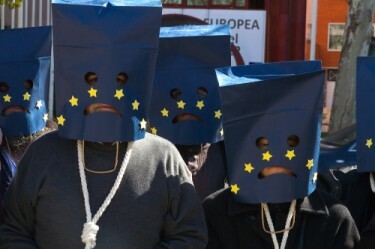 Last month, "European citizens organized a week of protests against the austerity measures imposed on the countries of the European Union as a strategy for ending the economic crisis. Known as the European Counter Summit, it is [a] response to the European Summit in which European leaders gathered, and an occasion to make the voices heard of those citizens who defend a “Europe for the people and not for the markets“. In Brussels, the protesters have chosen to bring their discontent to the European Council, while in Spain the Counter Summit week...culminated with a protest in the center of Madrid on Saturday, March 16." More from Elena Arrontes' article at Global Voices Online here.